Thoughts Of A Dork | A place where I share my thoughts about anything. A place where I share my thoughts about anything. The drama shows us happenings in the characters life from 1997-the present (2012). The story starts with the reunion of a particular batch of Busan High School students in 2012. And through flashbacks we get to see how their high school life was. 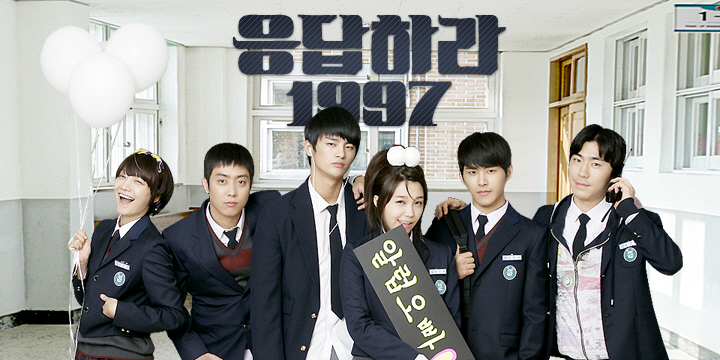 Reply 1997 is a 2012 drama and has has garnered praise from audiences and critics for being well-researched, refreshing, genuine, and full of humor and heart. The last episode had the highest rating ever for a cable channel. I can, because of the cliff hanging story. Who will marry who? The Cast. Yes! I love all of them. Honestly, I didn’t know Seo In Guk was first a singer than an actor. I thought he really is a full time actor same with Eunji. Both of them, nailed their characters. But aside from the lovable main cast I have to give separate praise to Sung Dong Il and Lee Il Hwa, who played Shi Won’s parents. They were so good. The characters made this drama. Shi Won nailed it as the crazy fangirl willing to camp out at her idol’s house or take part in epic fanwars. I can relate. HAHAHAHA fan girl obsessions. This really made me love the story. Yoon Jae, he could melt me in just a second. He begins to fall for his childhood friend Shi Won. His feelings was well written all over his face. He’s great! Flashback. I enjoyed going back and forth between past and present. Most dramas only go forward but here there’s also a feeling and thought of nostalgia that I find endearing. Although I’m too young to really understand the feeling as the story intends, there’s something about going back into the past clips and knowing that years later they’ve succeeded in some way that makes me smile. There is only around the end where the writers when a little overboard with the changes from past and present. Family and Friendship. I love how much work was put into the depiction of non-romantic relationships between the characters. The story might have revolved around romance, but there was just so much heart in the interactions between friends, siblings and parents. Several years ago Kong-Sil (Kong Hyo-Jin) was involved in an accident. Since that incident, Kong-Sil is able to see and hear ghosts. She’s also terrified of the ghosts that appear constantly around her. Because of this, she’s unable to live a normal life. Kong-Sil lives in a rooftop room at an extended stay inn. She makes a living by doing odd jobs at the inn, including cleaning. Meanwhile Joong-Won (So Ji-Sub) is the president of an extravagant shopping mall named Kingdom. He is also arrogant and calculative. Everything relates to him in terms of money. One raining evening, Kong-Sil goes to room 404 to clean, but she sees another ghosts. She freaks out and runs up to her rooftop room. The ghost, who looks like an old woman, appears right next to her again. Kong-Sil then does the old woman ghost a favor and goes to her home. She hands the ghost’s son a bankbook with more than 10,000 dollars in the account. Joong-Won sits face to face with a man who owns land that he needs to build a golf course. The man tells Joong-Won that his deceased wife does not want him to sell the land. Joong-Won doesn’t believe in ghosts and ignores him. He pulls out a contract which the man’s children already signed. Joong-Won is able to get the man’s signature. On his way back from that meeting, Joong-Won is driven by his assistant (Choi Jung-Woo). The driver then sees a woman thumbing for a ride. Joong-Won tells his driver to ignore the woman, but a light suddenly shines on them and the car stops. At this time, Kong-Sil hops into the car and thanks them for picking her up. Kong-Sil unintentionally touches Joong-Won and feels something unusual. Later, the car pulls over at a highway rest stop. While walking back to the car, Joong-Won sees Kong-Sil talking to someone, but there isn’t anyone else there. Thinking she might be crazy, Joong-Won turns around, but Kong-Sil grabs his arm. She discovers that whenever she touches him, the ghosts around her disappear. Back at her rooftop room, Kong-Sil is terrified by the ghosts around her as usual. She thinks back to Joong-Won and how the ghosts disappeared when she touched him. Kong-Sil decides to go Kingdom shopping mall to meet Joong-Won again. After I Hear Your Voice, I got hooked again by Korean drama. Its The Master’s Sun. Yes Im hooked from day 1 up to the very end. A horror, romantic, comedy drama. What can you ask for? For a KDrama addict like me, I can guarantee you 100% that this won’t disappoint you. This is not like other dramas I’ve seen. The twist is really great and it has an element of excitement as each episodes you were craving for the next. Every episode leaves you crying or laughing. The plot itself already hooked me. Despite the fact that I hate ghost concept, but hell the characters got into me. Almost each episodes has a different ghost stories. But this isn’t all about ghost. Like I’ve said, not a sweetie cutie romance but an interesting love story going on. Both lead actors are fun to watch. Also Kang Woo ang Yi-Ryeong. Also the Aunt and VP relationship is real funny. So Ji Sub and Gon HyoJin are the best pairing! Their chemistry is overflowing. GHJ, proved again how amazing and excellent actress she is. I must say she is one of the few versatile actresses that I like. Not to exaggerate, but seriously this drama is simply amazing. The actors did a great job portraying their roles. Interesting characters bundled with a great OST. HELLO MOMMY, IM SUPER JUNIOR DONGHAE. I ENVY THIS LUCKY GIRL. OMFG!! THE BEST FAN SERVICE EVER. DONGHAE WAS SO NICE TO PH ELFS. This blog is my little space where I share my random bits about my thoughts, ideas, rants and all. This is a random blog, where I, can write everything I want to. This blog is about lifestyle, beauty, fashion and mostly reviews about Korean dramas and movies. If anyone has an issue regarding my post or grammatical errors or any violent reactions, kindly contact me through my email address instead of posting through comments. If you have anything against me, email me and let’s discuss it privately. Arasseo?